This is the inaugural, and probably the most important project the ICBI will be associated with. Meditation is the central aspect of Buddhism and without it there would be no enlightenment. The act of meditation requires the ordering of the body and mind so that the frequency of everyday energy is refined and transformed toward a specific spiritual purpose. The body, once aligned, ceases to be an issue to the mind, and when the surface tension of the mind recedes, the troublesome 'ego' is brought under control. This 'inner gazing' is the Buddha's method, and although it is true that meditation can be performed whilst lying down, sitting, standing, and walking, whatever the preferred position, meditation will only be effective if the physical, psychological, and spiritual energy is aligned with vigour. A good test for the meditator is to assume the seated posture and turn the gaze inward. In this way the empty Mind Ground, or Dharmakaya will become self-evident and eventually the distinction between the 'observer' and the 'observed' will dissolve into an all embracing 'oneness' that is not limited to 'one', or 'two'. The Urban Ch'an Project is designed to encourage meditators of any level to go out into the urban areas and spend a moment or two (length of time is dependent upon circumstance) sat in meditation. This has the effect of reducing or removing the taints of greed, hatred, and delusion from the inner and outer world, and allowing the Dharmakaya to fully manifest in an unenlightened world. The characteristics of this manifestation are compasion, loving kindness, and pure wisdom. Those meditators of an advanced level of attainment may well live their lives entirely within the Dharmakaya manifesting - if this is the case, then the unenlightened world definitely needs the influence of this divine state. However, level of attainment, or experience of meditative practice is not an issue. The decision to meditate selflessly in a public spot already creates the necessary energy to transform the world here and now. Although I have been adopting the full-lotus position in my expression of this project, practitioners are reminded that they should sit in any way that is appropriate to their own circumstance - those who practice Pure Land, or Nicherin Buddhism, or any path that requires chanting, can simply sit and chant either inwardly where no one else can hear, or outwardly into the environment. I have visited Oxford recently - the place of my birth and the venue for part of my education. 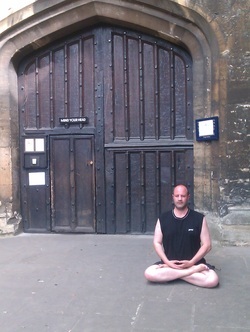 Oxford has a very high conscious level of general awareness and so sitting in public was easy to achieve. In London - where I live - the energy is different but equally compelling. London has a beauty all of its own, with many small but inviting parks and gardens scattered throughout the City. If participants are willing around the world, the ICBI supports urban meditation and suggests that photographs (if possible) be taken and shared on the new ICBI Facebook page.